Recounting the Anthrax Attacks | Free eBooks Download - EBOOKEE! 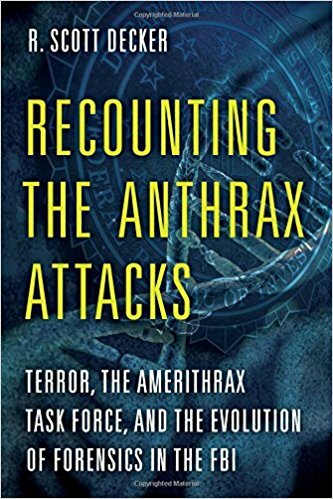 R. Scott Decker, "Recounting the Anthrax Attacks: Terror, the Amerithrax Task Force, and the Evolution of Forensics in the FBI"
It was September 18, 2001, just seven days after al-Qaeda hijackers destroyed the Twin Towers. In the early morning darkness, a lone figure dropped several letters into a mailbox. Seventeen days later a Florida journalist died of inhalational anthrax. The death from the rare disease made world news. These anthrax attacks marked the first time a sophisticated biological weapon was released in the United States. It killed five people, disfigured at least 18 more, and launched the largest investigation in the FBI's history. Recounting the Anthrax Attacks explores the origins of the innovative forensics used in this case, while also explaining their historical context. R. Scott Decker's team pursued its first suspect with dogged determination before realizing that the evidence did not add up. With renewed energy, they turned to non-traditional forensics-scientific initiatives never before applied to an investigation-as they continued to hunt for clues. These advances formed the new science of microbial forensics, a novel discipline that produced critical leads when traditional methods failed. The new technologies helped identify a second suspect-one who possessed the knowledge and skills to unleash a living weapon of mass destruction. Decker provides the first inside look at how the investigation was conducted, highlighting dramatic turning points as the case progressed until its final solution. Join FBI agents as they race against terror and the ultimate insider threat-a decorated government scientist releasing powders of deadly anthrax. Walk in the steps of these dedicated officers while they pursue numerous forensic leads before more letters can be sent until finally they confront a psychotic killer. 2017-11-04[PDF] The Anthrax Letters: A Medical Detective Story. No comments for "Recounting the Anthrax Attacks".